"Well that's certainly ruined my day," I tell my son as we stand in Saltoun Street, looking up at the block of flats that inspired the celebrated Glasgow painting, Windows in the West. We've just finished a pleasant pavement lunch at Crolla's Gelateria on Byres Road, although he's pulled a muscle in his back and is quieter than usual. 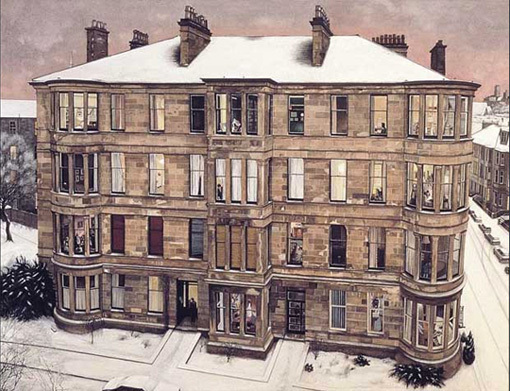 Until that is I offer to show him the original of artist Avril Paton's best-known work. "You don't need to," he says. "I know it well." 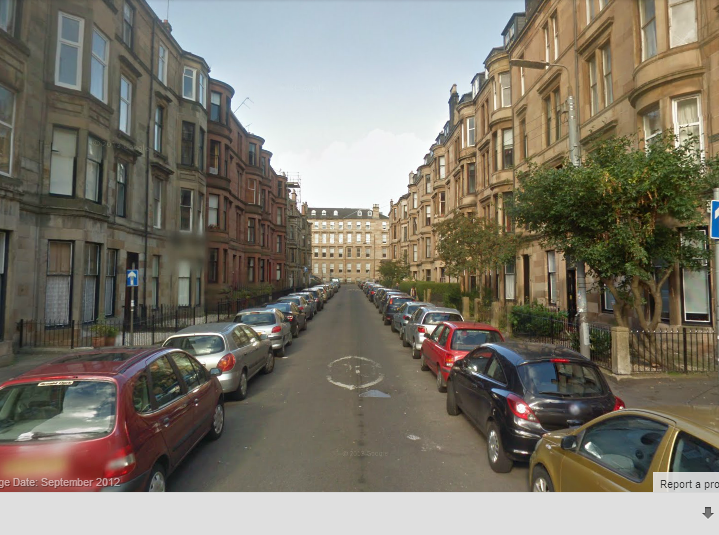 "There it is," I say, as we turn left into a narrow road, flanked by parked cars and solid sandstone flats, their roofs forming, from our perspective, a large V in the sky, the vanishing point blocked by the paler stone of 60 Saltoun Street, right at the end. "No it isn't," he says. "Yes it is," I tell him. "I lived there on the top floor when I was a student 40 years ago, with my oldest friend, Ian Dalziel. You know Avril Paton has these little figures in some of her windows?" "I really like those," my sister says. "It's a wee glimpse into people's lives. It's intriguing. You'd like to know what they're doing. You want to learn more about them." "Well now you have," I tell her. "One of them was me." "It couldn't have been you," my son says. "Because a) she didn't do the painting until long after you'd left. And b) that's not the block of flats she painted. Follow me and I'll show you the right one." So here we are looking up at the sky-etched symmetry of number 35, with its round bow windows at either end and square-cut bay windows running up the centre. There's no doubt it's easier on the eye than number 60, but I cling to my illusions a little longer. "It is," he insists. "She painted it from a flat above where we're standing now. Do you want to hear what she says about it?" "It was something like this," he says, screwing his eyes half-shut to help him remember. "'On January 11th 1993 there came a sudden heavy blizzard. In ten minutes it was over and the view from the attic window at Athole Gardens overlooking Saltoun Street was transformed. The lilac pink sky, the lit windows, the clarity of whiteness where there had been darkness - it was magic.'" "That's beautiful," Helen says, the poet in her moved by evocative words. "It's annoying," I say, the codger in me moved by being wrong again. "I've been telling people for years I used to live in Windows in the West. Well that's certainly ruined my day." "Surely it's best to know the truth," Sis says, trying as always to console me. "I don't think so," I say. "Illusions are better. When we lived in this street, Ian and I had a friend called Charlie Dundas - a lovely guy with big brown eyes and an articulate, literary sense of humour." "Fascinating as I find your reminiscences," my son says, turning back towards Byres Road, "I'm wondering if there's a point to this one." "There is," I say. "Charlie was short-sighted but he would never wear specs. He loved the element of surprise, he said, that their absence brought to his life. "He would look at mysterious shapes in the middle distance and they might be giants. They could be unicorns. People walking towards him were Marilyn Monroe or J.D. Salinger, until they got in close. "Then he said something that has always stuck in my mind." "What was that?" Helen asks. "'Life is better when it's blurry at the edges.'"